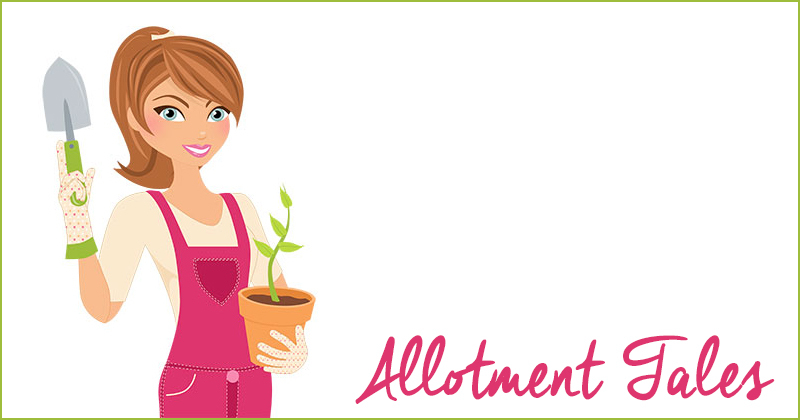 This month marks our first anniversary as allotmenteers and what a year it’s been! As I’ve mentioned previously I’ve been growing veggies for a fair few years now but never on the scale of an allotment, more like a few raised beds and the odd plant pot here and there! The biggest issue with having an allotment is we have to be working at least 70% of the ground over the growing season, as per our Parish Council regulations. When we took away the amount of ground given over to paths, the tool shed and the compost bin, that left us with around 80% of workable ground so we’ve had to keep each raised bed well stocked in order to meet the regulations. No sooner does one crop come out of the ground than there’s another waiting to take its place. The peas were promptly replaced with a catch crop of dwarf french beans and the onions were very swiftly followed by turnips, swede, kale and broccoli. Our potato bed is now home to an Atlantic Giant pumpkin plant that is definitely not living up to its hefty name. It’s yet to set fruit and it looks doubtful that it will produce anything in time for Halloween. Since it’s not taking up as much space in the potato bed as I’d intended we’ve sown a couple of trays of cabbages and cauliflowers that will be keeping the non-pumpkin company as soon as they’re hardened off. It’s not all been hard graft, there have been one or two humourous moments that have kept our spirits up. You should’ve been there the day that I tried to pop the pop-up cloche. I didn’t have enough hands to hold two sides open while unfurling a third. I ended up wedged inside the darned thing! And then there was the time I became a little worried about the poor growth of our runner beans. They’d grown to about a foot tall and then stopped. I ran soil tests, fed them with Phostrogen and applied mulches. You name it, I did it. Refusing to admit defeat I decided to sow the remaining seeds and it was only then that I noticed the word ‘dwarf’ on the packet. Um… yeah…. a facepalm moment if ever there was one. August saw us harvesting the first of our sweetcorn. 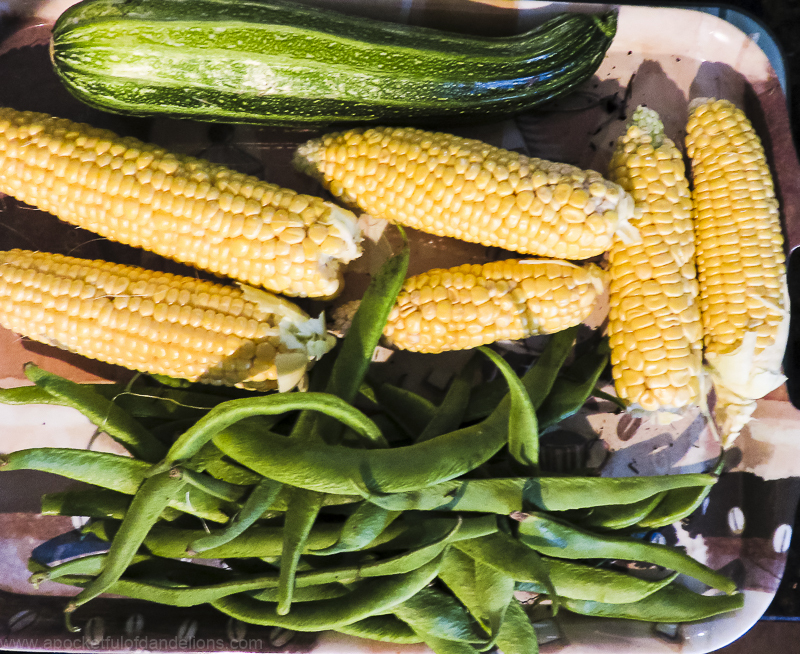 Ours wouldn’t win any prizes at an agricultural show but, oh my goodness, nothing tastes as sweet as freshly picked sweetcorn! This month I thought I’d take a little bit of video during one of my visits to the plot. I thought it would be fun for you to actually see what I’ve been blathering on about for so long. See if you can spot the moment I trip over the corner of the potato bed! I am so light and dainty on my feet. Ha ha! While I was filming the video I noticed that our entire bed of leeks had developed rust. Rust is a fungal disease that attacks the leaves of leeks, onions and garlic and ultimately causes the affected plant to shrivel up and stop growing. I had hoped that when I harvested our patch of garlic I’d nipped the rust problem in the bud but apparently not. 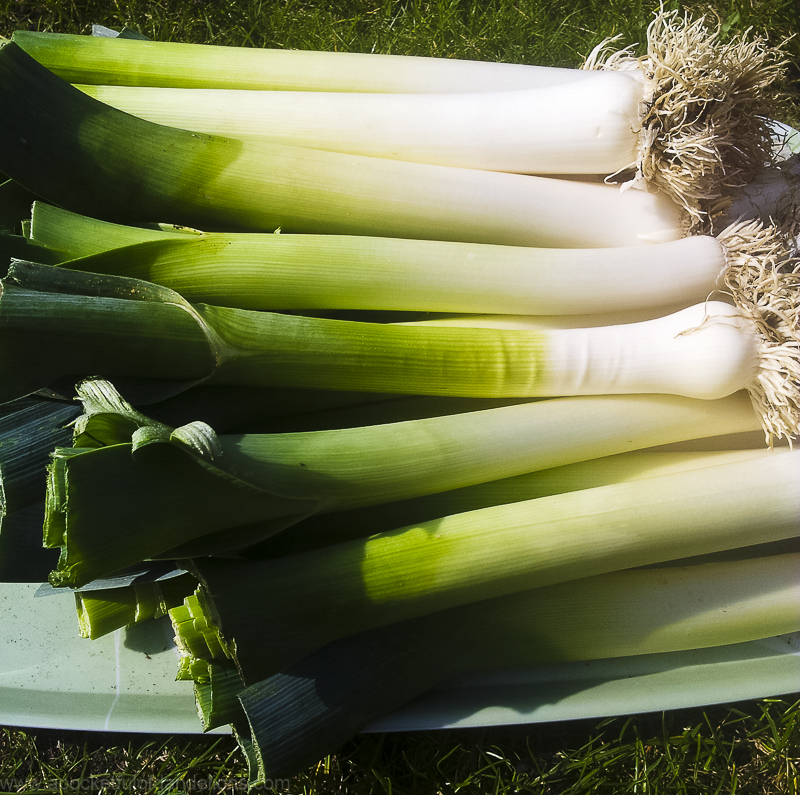 There was nothing for it but to harvest, wash and trim every leek. All 50+ of them. A heck of a job for one person let me tell you. My back still hasn’t recovered! They look, and taste, pretty good though. The seed catalogues have already started landing with a thump on our doormat and we’re beginning the task of choosing what to grow over the coming year. A rust resistant variety of leek is definitely on the list that’s for sure, along with sweet onions and peppers. I have plans for a trough of tulips and lilies to attract pollinating insects too. Overwintering onions, garlic, brassicas, beans and peas need to be ordered now so that they arrive in time to be in the ground before the first frosts hit. The daytime temperatures in Fleet have begun to drop dramatically and night-time temperatures are barely breaking double figures. I don’t think it will be too long before the frosts arrive. Now I’m off to rest my poor aching back before all of my seed orders arrive and I’m back to being knee-deep in compost. Wow, that looks like a lot of ground to have to work if you are busy! Oh what a lovely guided tour, thank you 🙂 you’re definitely more green fingered than me, all my plants look like miniature versions of yours but without the dwarf variety excuse!! Thank you Carie! I’m thinking about doing regular video updates as it’ll be great to look back on and see how it changes with the seasons.